Singapore's economy should grow by close to 3 per cent this year, Prime Minister Lee Hsien Loong said on Sunday (Monday morning Oct 23, Singapore time). 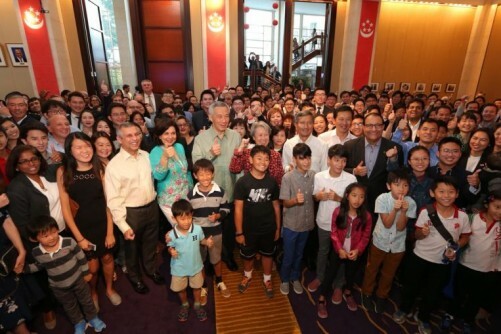 He gave his upbeat assessment of the country's prospects in a short speech to over 200 Singaporeans living in Washington at a reception at Singapore's Embassy in the United States. It comes as advance estimates from the Ministry of Trade and Industry this month put year-on-year growth for the third quarter of this year at 4.6 per cent. Mr Lee noted this was due to a strong showing by the manufacturing sector, and added that services performed "okay" as well. The Government had in August revised its growth estimates for 2017 to between 2 and 3 per cent, and Mr Lee said he expects the full year figures will be at the upper end of this range. He is on a six-day visit to the US, where he will meet President Donald Trump and key administration officials. He will also take part in two dialogues - at the Economic Club of Washington, DC and at the Council of Foreign Relations. Singapore Airlines and Boeing will also sign a S$19 billion agreement for at least 39 new planes on this visit, and the deal will create a lot of jobs, he noted. Mr Lee told the Singaporeans that Singapore's ties with the US are wide-ranging, and these go on regardless of a change in administration. It is also important for Singapore leaders to get to know key players in every administration, as there is much at stake in Singapore's ties with the US, he added. America is a big factor in the region and it is important to know its thinking and preoccupations, he noted. Mr Lee also noted that while Singapore's economy is doing better, a difficult part it needed to work on is improving productivity. "We have to work at it patiently sector by sector," he said, noting that 23 industry transformation maps are being rolled out to help on this front. These will help "create better jobs for our people" and better assurance that they will have good jobs, he added.